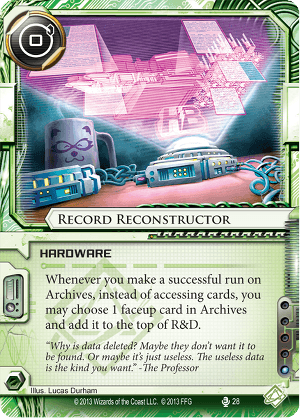 Whenever you make a successful run on Archives, instead of accessing cards you may choose 1 faceup card from Archives and add it to the top of R&D. ...run unprotected archives 4 times a turn (yes, all your clicks), 10 turns in a row. 4 times a turn makes sure runner won't get a new card (mandatory draw + 3 clicks). Do this 10 turns in a row with Datasucker, Desperado and John Masanori in play. After this break, game resumes. But meanwhile you have shaped the perfect hand, you have 40 credits and 40 virus tokens on Datasucker. You're ready to win. If Corp purges virus counters, head for another 10 turns :) Stalemate. Force the draw in a tournament if you're in a bad situation. I think now it's useful when you want to hostage some of the corp executive, like Chairman Hiro or Director Haas etc., returning them from archives and then trashing (and adding to the score area) from RnD. you realize that if there are no cards in Archives, you cannot put anything on top of R&D. This means RR has little use early in the game. Even if you do use it, you're probably going to be giving the Corp back Operations, which will only help them. Beh with yog is strong. Oh so u trashed enigma cuz was useless?? Kk, just run r&d until you will find nothing useful and then add enigma on top. It will permit you to gain datasucker tokens and credits from desperado. Always a good thing.